It’s a great idea to buy your mum and dad a Valentine’s Day gift. They have loved you from the day you were born, even through your hormonal teens and narcissistic personality traits, when lesser mortals left you alone, or ran to the hills! 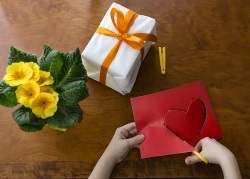 Here we look at some affordable gift ideas appropriate for mum or dad they are sure to love. Spending time with the one’s you love is the best Valentine’s Day gift you can offer. If you can’t see your mum or dad on Valentine’s Day itself, book another day where you can visit and watch a movie together. Hotel Salvation is a kind and sensitive multi award-winning film of life and relationships in Indian culture and Hindu rituals. Daya, a 77-year-old father, and Rajiv, his over-worked accountant son, journey to Hotel Salvation in the holy city of Varanasi. Rajiv struggles with anxiousness about his responsibilities back home, while Daya starts to blossom as he befriends a delightful widow. The performances are superb, from renowned actors Adil Hussain, Lalit Behl and Geetanjali Kulkarni. 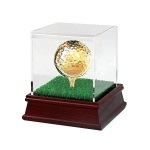 If one or both of your parents like to play golf, a 24 karat gold-plated golf ball and tee set comes in two styles of gold-plated golf balls. One style is for display only and the other is one use can use in play. Both come in a set with a gold-plated tee, presented in a beautiful display pouch. The gift is a good conversation starter out on the green or at home where they’ll draw immediate attention. Add a touch of luxury to your parents wardrobe with an Italian cashmere sweater each. Being soft and lightweight it’s versatile to be worn when dressing up, but also looks great when dressed down with jeans. If your parents enjoy working in the garden, a set of tools in an easy-carry tote will help them get the results they want. Include a gardener’s knee pad to save their joints after a long morning knee deep in weeds and plants. There are a range of ergonomic gardening tools to help reduce the wear and tear on joints, including power-enhancing hand pruners that reduce the risk of a repetitive strain injury. Also, save their knees with a portable gardening seat that reduces stooping and bending. This is a great game for your parents to play with other couples in their peer group. 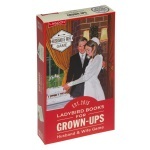 With images taken from the original Ladybird books, the Ladybird Husband and Wife Game will reveal just how well mum and dad know each other, providing hours of entertainment and perhaps a few strong debates. There are 100 question cards that can be used in a game for up to four couples. What I Love About You, by me. It’s not always easy telling your parents you love them, but it’s great if you do. Saying why is even better and there’s a little book that makes it easy, by giving you space to simply fill in the blanks. The book comes with a keepsake box to give a unique and meaningful gift for your parents to treasure forever. A small piece of wall art that your parents can see each day as they pass by it in their home, is so simple that it’s perfect. A contemporary frame with the message on canvas saying simply “You Make My Heart Smile” will look good in any room and is also certain to bring your parents a bit of happiness in a similar way. If your parents enjoy the outdoors, there are few things more cosy or romantic than gathering round a fire outdoors. The gift of a simple fire bowl will allow them to have a wood fire in the garden and so extend the number of days in the year that they can enjoy the great outdoors together and with friends. Choose a heavy duty fire bowl made from cast iron that will last for years and sit it on a separate tripod stand. Buy a fire screen as a guard if it’s necessary to keep the grandchildren safe. The gift of a relaxing spa break allows parents to go away for just a few hours or overnight. Spa deals offer the opportunity for them to have a quiet and self-indulgent few hours, where they can reconnect and have a chance to cut off from the world at a time of their choosing. From steam room to jacuzzi, from deep tissue massage to beauty treatments your parents will feel refreshed by their visit and can enjoy great food too. Looking for a Gift That Will Last Forever?